The Types of Stocks we cover can be seen by checking out our list and performance from past years, see 2018, 2017 and all years since 2000. The graph below is updated through February 28, 2019. Many of our stocks are mid-size companies. Mostly profitable, dividend-paying companies. And we also feature some of the largest and best known companies in North America as well. We have Canadian stocks (some of which also trade in the U.S.) and also a good selection of U.S. stocks. We also have high yield Canadian entities as well as growth stocks. 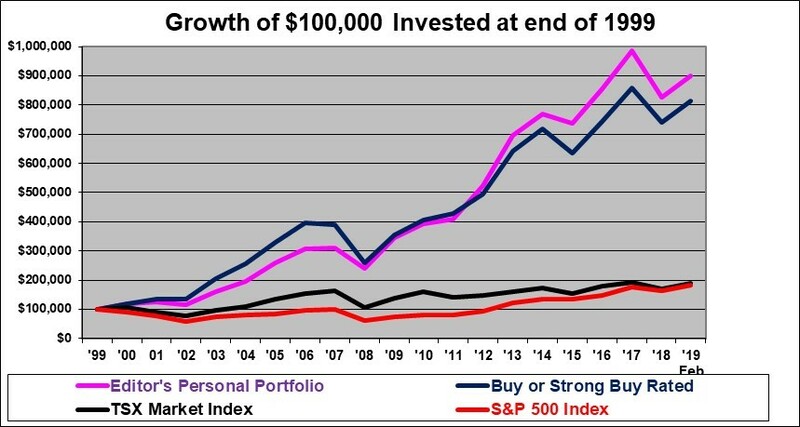 Our Stock Picks have returned an average of 11.1% per year in the 19 years ending in December 2018 (despite some down years) – not counting dividends and have had only four negative return years during that time. We generally have no oil and gas stocks, no gold stocks, no mining stocks, no penny stocks, and no scientific research oriented stocks. Those stocks do not lend themselves to fundamental analysis using financial statements. What we do have is companies engaged in businesses including: retailing, software, banking, insurance, communications, transportation, real estate, property development, home building, and consulting engineering, and also a selection of higher dividend yield entities. To invest in our Stock Picks you will need to have an investment account with your bank or brokerage. If you don’t have one, check out our article on how to get started. We use fundamental analysis techniques only. This includes both numerical and non-numerical analysis. We attempt to identify companies that are under-valued in the market. Also we attempt to identify highly profitable companies and then ride along with them as they compound up their values over time through growth. A Web Page with a Table of our Buy / Sell Stock Ratings backed up by detailed and yet concise research reports on each stock. (About 30 stocks are usually listed). comments (prior to each trading day) with our editor’s thoughts on certain aspects of the the markets and any stock buying or selling that he has done or is contemplating. Subscribers log in as often as daily to check for our daily comments and any updates to the Stock ratings. Click the Subscribe button just below to pay by credit card (see below to pay by cheque). Our returns have been very good. But we make absolutely no promises or guarantees about the future. We will continue to do what has worked in the past but we make no promises about returns. We can however promise to continue to provide honest and transparent analysis. Or you can cancel by contacting us at shawn@investorsfriend.com. Cancellation prevents any further automated renewals. We also, of course, welcome payments by cheque. The charge is the same as the above. Be sure to include your email address. We are located in Canada and have traditionally marketed our product to Canadians. About half of our Stock Picks trade on the U.S. exchanges. The remainder trade in Toronto and depending on your broker it may be a little more difficult for Americans to buy stocks on Toronto. But certainly it is possible to do so. Your satisfaction is guaranteed! If you are not satisfied with the subscription access to the stock research provided, simply request a refund within 6 weeks of subscribing and all your payment(s) will be promptly refunded to your credit card, no questions asked. Note: Since subscribers get access to over 30 research reports that are each 4 pages long, including the graph, and with updates occurring on an ongoing basis, the research is available by internet access only. Hard copies by postal mail are not available. All stock ratings presented are “generic” in nature and do not take into account the unique circumstances and risk tolerance of any individual. The information presented is not a recommendation for any individual to buy or sell any security. The author(s) is (are) not registered investment advisors and the information presented is not to be considered investment advice. The reader should consult a registered investment advisor or registered dealer prior to making any investment decision. The author(s) may at times have a security position in the companies presented. (Such positions are disclosed).